A sushi parlour, ramen bar and izakaya all-in-one. You'll find Barangaroo's new Japanese hotspot, Sushi Hon Izakaya, on Scotch Row as part of the Sushi Hon chain; however this venue has a charming point of difference from their other venues. 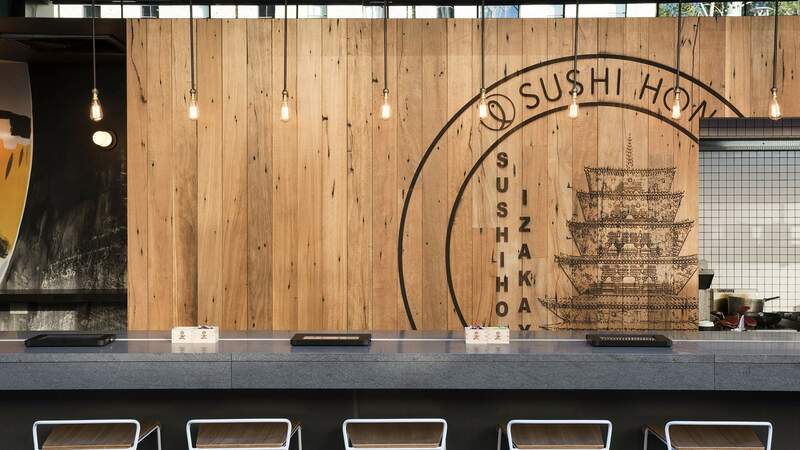 As well as serving up fresh sushi for takeaway or eat-in purposes, they're also serving up some fierce interior design thanks to a partnership with agency Design Clarity. The restaurant sports a lengthy laneway-style layout and is divided into three distinct areas. On one end you'll find a hawker-style sushi dispensary for all your on-the-go lunch needs. This section then morphs into a sit-down sushi parlour with tablet ordering system for folks who like to privately stuff their faces without interruption. While the first two spaces reflect the lunch-time needs of the surrounding office workers (easy and intimate settings for a quick bite), the ramen bar at the end is definitely for the after-work crowd. The design is inspired by the Tokyo nightclub scene and features mirrored ceilings, graffiti murals and perimeter bar seating for singles. This, frankly, is the ideal setting in our opinion — all nightclubs should all serve ramen. Alongside good food and great interiors, Sushi Hon also serves up Japanese beers, umeshu and sake cocktails for all your knock-off bev needs.